Who’s ready for another clock contest? The time is now! Submit your latest clock project(s) in our Fall Clock Contest for a chance to win one of four $100 Klockit gift certificates. Thank you to those who submitted feedback from previous clock contests. Your feedback helped us create a better clock contest experience for everyone. We hope you’ll enjoy our Fall Clock Contest! NOTE: Your entry must include which category you are submitting in to, at least one photo of your clock, and the story behind your project. All entries must be received by 11:59 p.m. CDT on October 31, 2015. (1) Master Clock Maker: For expert clock makers. Judged on picture(s) provided and story behind the clock build. (3) Most Creative Clock: Judged on picture(s) provided and story of what makes the clock creative. (4) Junior Clock Maker: For clock makers 17 years old and younger. Judged on picture(s) provided and story behind the clock build. Four (4) Best-of-Show winners will be chosen; one from each category mentioned above. The winners will receive one (1) $100 Klockit gift certificate. Entries will be judged based on a scale of 1 to 5. A panel of judges made up of Klockit staff will rate the finalists. The averages of the ratings determine the winners. Winners will be announced and contacted the third week in November. When the winners are decided, they will be announced here on the Klockit blog, and on the Klockit Facebook and Twitter pages. Post your question on this blog post below or on our Facebook and Twitter pages. Or email contest@klockit.com. Thank you to all who participated in our fall clock contest. The contest entries for this clock contest were exceptional and the Klockit team would like to recognize the time and effort that was put into each clock. Congratulations to Dennis Menke, Jim Cate, and Rachel Calloway! See each of their photo(s) below and read their stories behind the clocks. Please join us in congratulating them! 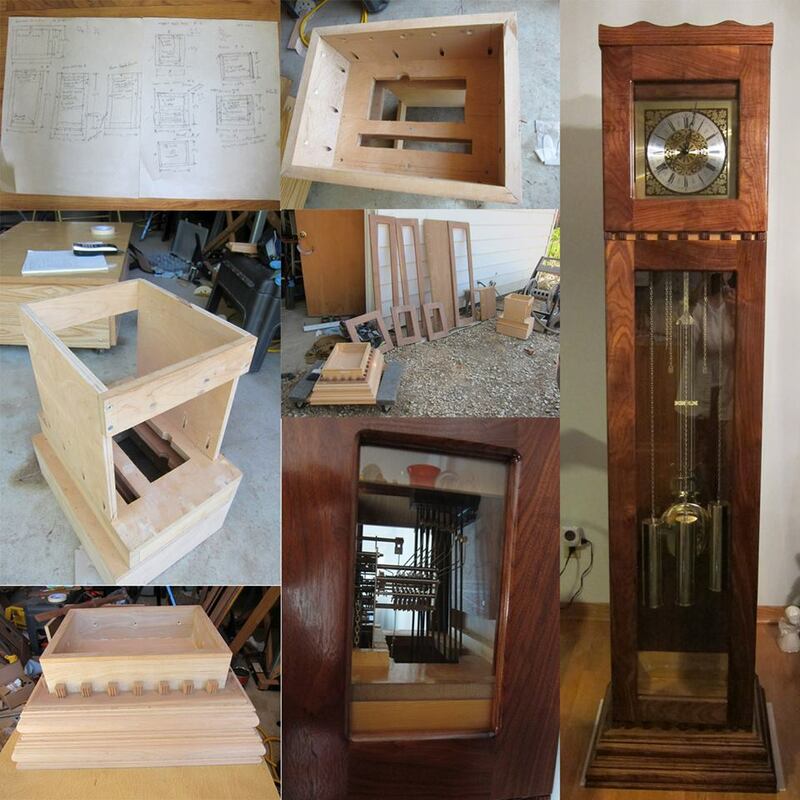 “I ordered the 16” Time Ring Clock Plan and adapted it to make a wedding gift for my nephew Andy and his fiance Kate. I was able to personalize it with their names as well as the wedding date to provide an everlasting keepsake that will last for years and years to come. I really enjoyed the time I spent working on it knowing that it would be appreciated. “The clock features a simple, contemporary design. I have a feeling of accomplishment, wonder, and great satisfaction that I was able to build such a large project to completion. Thanks to Klockit for making it all happen. I did not want an ornate enclosure so I decided to build my own case. The enclosure is built using walnut for framing with internal maple inserts to mount frame parts. Fluted spacers are used to separate ‘base from bottom of bottom enclosure’ and also ‘top of bottom enclosure and bottom of top enclosure’ to accentuate the maple inserts. The bottom maple insert is part of the base and the top maple insert is part of the clock mount. The base is oak molding built by using 2 layers of the same molding situated with the bottom layer extending out beyond the top layer. The top crown is also oak molding and must be removed to allow top enclosure to be lifted above movement needing repair, with an 8-foot ceiling. “My partner and I make a lot of things out of recycled bicycle parts, with clocks being our most recognized pieces. 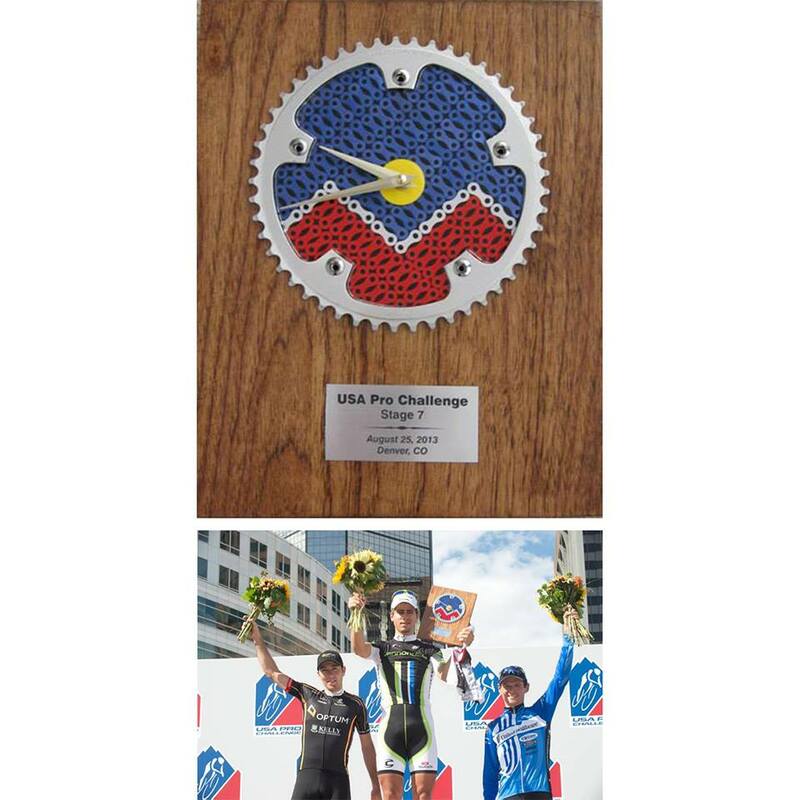 My work actually gained enough notoriety to land me the commission for the 1st place winner for Stage 7 (Denver) of the US Pro Challenge (the biggest professional bicycle race in North America). With over 100 entries, it was hard to choose just 3 winners. Please congratulate these Honorable Mention entrants! NO PURCHASE NECESSARY TO ENTER OR WIN. VOID WHERE PROHIBITED BY LAW OR REGULATION. PARTICIPANTS MUST BE 18 YEARS OF AGE OR OLDER AT THE TIME OF ENTRY. This Contest is in no way sponsored, endorsed or administered by, or associated with Facebook, Twitter, or Pinterest. This promotion is open to legal U.S. residents including residents of Puerto Rico (excluding U.S. Virgin Islands, Guam, other United States territories and Hawaii) and legal residents of Canada (excluding the Province of Quebec), who are at least eighteen (18) years of age at the time of entry. You understand that you are providing your information to Primex, Inc. and not to Facebook, Twitter, or Pinterest. The Klockit Create-A-Clock Contest (the “Contest”) entry period begins on September 2, 2014 at 12:01 a.m. Central Standard Time (“CST”) and ends on September 30, 2014 at 11:59:59 p.m. CST (the “Entry Period”). Entry in the Contest does not constitute entry into any other promotion, contest or sweepstakes. The Contest will award three (3) winners one (1) $100 Klockit gift certificate for each category. Winners will be judged based on their photo and story submission in three (3) categories: Master Clock Builder, Gift of Time, and Most Unique Clock. The Contest will be judged by the staff at Klockit. By participating in the Contest, each entrant unconditionally accepts and agrees to comply with and abide by these Official Rules and the decisions of Primex, Inc., N3211 Country Road H, Lake Geneva, WI 53147 (the “Sponsor” and “Judges”), whose decisions shall be final and legally binding in all respects. This promotion is open to legal U.S. residents, including residents of Puerto Rico (excluding U.S. Virgin Islands, Guam, other United States territories) and legal residents of Canada, at the time of entry and who are at least eighteen (18) years of age at the time of entry. Employees, officers, and directors of Sponsor, Administrator, Judges, promotion prize suppliers, and each of their affiliated companies, subsidiaries, licensees, distributors, dealers, sales representatives, retailers, printers, individuals engaged in the development, production or distribution of materials, their advertising and promotion agencies, and any and all other companies associated with the promotion agents (collectively, the “Promotion Entities”), and each of their immediate family members (as defined by the IRS) and/or people living in the same household are not eligible to participate. All eligibility is subject to all federal, state, and local laws and regulations. All entries submitted are the property of the Sponsor. NOTE: Your entry must include which category you are submitting to (see below), at least one (1) photo, and they story behind your clock project. All entries must be received by 11:59 p.m. CST on September 30, 2014. Gift of Time: Judged on picture and story of satisfaction and joy of giving clock as gift. Most Unique Clock: Judged on picture and story of what makes clock unique. Multiple entries per person allowed over the Contest Entry Period; may enter in multiple categories, but will not be declared winner in more than one (1) category. No entry may be obscene, pornographic, violent, offensive in any manner, or in any other way not suitable to be published. If an entry falls into this category their corresponding entry will become void. Entries that do not meet the post specifications, or description specifications, or otherwise do not comply with the Official Rules herein may be disqualified. Any attempted form of entry other than as described herein is void. Sponsor will determine in its sole discretion, what constitutes a valid entry. All materials and boards submitted become the property of the Sponsor and will not be returned or acknowledged. Sponsor reserves the right to cancel or modify the Contest if it determines that for any reason the Contest cannot be run as originally planned or if fraud or technical failures destroy the integrity of the Contest as determined by the Sponsor, in its sole discretion, and to award the prize based on eligible entries received prior to the cancellation. Entry Notes: Entries made on another’s behalf by any other individuals or any other entity, including but not limited to commercial contest/sweepstakes subscription notification and/or entering services, will be declared invalid and disqualified for this Contest. Tampering with the entry process or the operation of the Contest is prohibited and any entries deemed by Sponsor, in its sole discretion, to have been submitted in this manner will be void. In the event a dispute regarding the identity of the individual who actually submitted an entry cannot be resolved to Sponsor’s satisfaction, the affected entry will be deemed ineligible. By entering, all participants and/or entrants release the Sponsor and Judges from and against all claims, expenses and damages arising in connection with each entrant’s participation and/or entry in the Contest and/or his/her receipt or use of the prize awarded in this Contest. By entering the Contest, entrants confirm that posts submitted from other sources do not violate the intellectual property rights of third parties. Entries found to be violating the intellectual property rights of third parties may be disqualified at the sole discretion of the Sponsor. Sponsor is not responsible for problems downloading or uploading of any Contest-related information or any other technical malfunctions of electronic equipment, computer on-line systems, servers, or providers, computer hardware or software failures, phone lines, failure of any electronic mail entry to be received by Sponsor. Only the prizes listed below will be awarded in this Contest. Odds of winning a prize depend on the total number of eligible entries received. $100 Klockit gift certificate for the Best-of-Show clocks in each of these categories: Master Clock Builder, Gift of Time, and Most Unique Clock. All other incidental expenses not mentioned herein are the responsibility of the Winner. All taxes on prizes are the Winner’s sole responsibility. Prizes are not transferable or redeemable for cash. Sponsor reserves the right to make equivalent substitutions as necessary, due to circumstances not under its control. WINNER NOTIFICATION: Conduct of the Contest is under the supervision of the Sponsor. Potential prizewinners will be notified by email using the contact information provided at the time of entry. Sponsor shall have no liability for any potential prizewinner notification that is lost, intercepted or not received by any potential prizewinner for any reason. If, despite reasonable efforts, any potential prizewinner does not respond within (48) hours of the first notification attempt, or if the prize notification or prize is returned as unclaimed or undeliverable to such potential prizewinner, such potential prizewinner will forfeit his or her prize and an alternate winner may be selected. If any potential prizewinner is found to be ineligible, or if he or she has not complied with these Official Rules or declines a prize for any reason prior to award, such potential prizewinner will be disqualified and an alternate prizewinner may be selected. Acceptance of any prize constitutes prizewinner’s permission to use prizewinner’s entry materials, photograph, name, likeness, voice, biographical information (and those of any other individual appearing in the photo), statements and complete address (collectively, the “Attributes”), for advertising and/or publicity purposes worldwide and in all forms of media now known or hereafter devised, in perpetuity, without further compensation or authorization, (except where prohibited by law), and releases the Promotion Entities from all claims arising out of the use of such Attributes. Prizewinners grant the Sponsor and their agents a non-exclusive, irrevocable, worldwide, perpetual, royalty-free license to record, copy, publish, use, edit, exhibit, distribute, perform, merchandise, license, sublicense, adapt and/or modify all materials submitted in connection with the entry in any way, in any and all media, without limitation and without any compensation to the entrant. Prizewinners assign all intellectual property rights, including copyright, and waive all moral rights, in and to the entry, in favor of the Sponsor. Sponsor reserves the right in its sole discretion to disqualify any individual who is found to be tampering with the entry process or the operation of the Contest, to be acting in violation of these Official Rules. Sponsor, Judges, Pinterest and the Promotion Entities are not responsible for, and entrant hereby releases Sponsor, Judges, Pinterest, and the Promotion Entities from any claims arising from: (i) technical failures of any kind, including but not limited to the malfunctioning of any computer, cable, network, hardware or software; (ii) the unavailability or inaccessibility of any transmissions or telephone or Internet service; (iii) unauthorized human intervention in any part of the entry process or the Promotion; (iv) electronic or human error which may occur in the administration of the Promotion or the processing of entries; (v) any injury or damage to persons or property, including but not limited to entrant’s computer, hardware or software, which may be caused, directly or indirectly, in whole or in part, from entrant’s participation in the Contest and (vi) use of any prize. Except where prohibited, entrant agrees that: (1) any and all disputes, claims and causes of action arising out of or connected with this Contest or any prize awarded shall be resolved individually, without resort to any form of class action (2) any and all claims, judgments and awards shall be limited to actual out-of-pocket costs incurred, including costs associated with entering this Promotion, but in no event attorneys’ fees; and (3) unless otherwise prohibited, under no circumstances will entrant be permitted to obtain awards for, and entrant hereby waives all rights to claim, indirect, punitive, incidental and consequential damages and any other damages, other than for actual out-of-pocket expenses, and any and all rights to have damages multiplied or otherwise increased. To obtain the name of the winners, send a self-addressed stamped envelope to: Klockit, c/o Marketing Department, N3211 County Rd. H, Lake Geneva, WI 53147. All such requests must be received by October 15, 2014. It’s back! Our create-a-clock contest is back and it’s time to submit your latest clock project(s) for a chance to win one of three $100 Klockit gift certificates. We’ve revamped the three categories and judging criteria for the Fall contest. The first category available for submission is called Master Clock Builder, and will be judged on the picture(s) submitted, along with the story of the project’s intricacy. The next category is called Gift of Time, and will also be judged on the picture(s) submitted plus the story of satisfaction and joy of giving the clock as a gift. Last but not least, the third category for this contest is called the Most Unique Clock, and will be judged based on the picture(s) submitted and an explanation of what makes the clock unique. NOTE: Your entry must include which category you are submitting to (see below), at least one (1) photo, and the story behind your clock project. All entries must be received by 11:59 p.m. CST on September 30, 2014. (1) Master Clock Builder: Judged on picture and story of project intricacy. (2) Gift of Time: Judged on picture and story of satisfaction and joy of giving the clock as gift. (3) Most Unique Clock: Judged on picture and story of what makes the clock unique. Winners will be announced and contacted the first week of October. When the winners are decided, they will be announced here on the Klockit blog and on the Klockit Facebook, Twitter, and Pinterest Pages. First and foremost, we’d like to thank all who participated in our spring Create-a-Clock contest. The entries for this contest were especially outstanding, and our team would like to recognize the time and effort that was put into each piece. Tom Heichel’s reclaimed barn wood clock was selected as the best of show in the Gift of Time category. Tom told us he was not one to enter contests, but we are glad he did! As far back as his early school days, clocks have intrigued Tom. He can remember always stopping in his dad’s hardware store on the way home from school, just to look at the Seth Thomas clock hanging on his wall. Today, at 73 years of age, that same clock is proudly displayed on his dining room wall. In September 2012, Tom was diagnosed with pancreatic cancer. Realizing then, more than ever before, that time is the most precious commodity of all, Tom went into his wood shop to build clocks for his family members and closest friends. All of the clocks have movements, dials and hands furnished by Klockit. These wonderful individuals had given their time and support to Tom, and it didn’t take him long to decide what he wanted to do for them. Tom made 9 clocks; all are similar but yet unique in their own way. 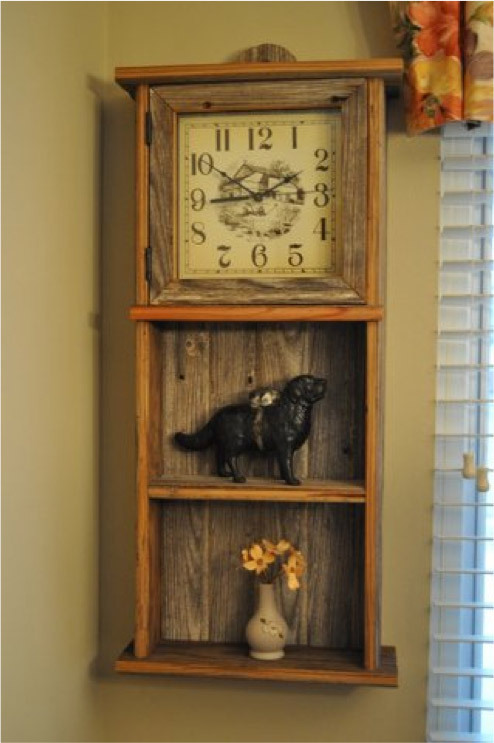 All handcrafted by him, 2 were made from reclaimed wood (barn board), fitting the personalities of those families. His wife’s clock was made from her childhood dresser that had been passed from family member to member and back to them again. They didn’t have a need for the dresser, but she didn’t have the heart to let it go. Tom carefully took it apart, stripped the many coats of paint, and built it into a beautiful clock for her. 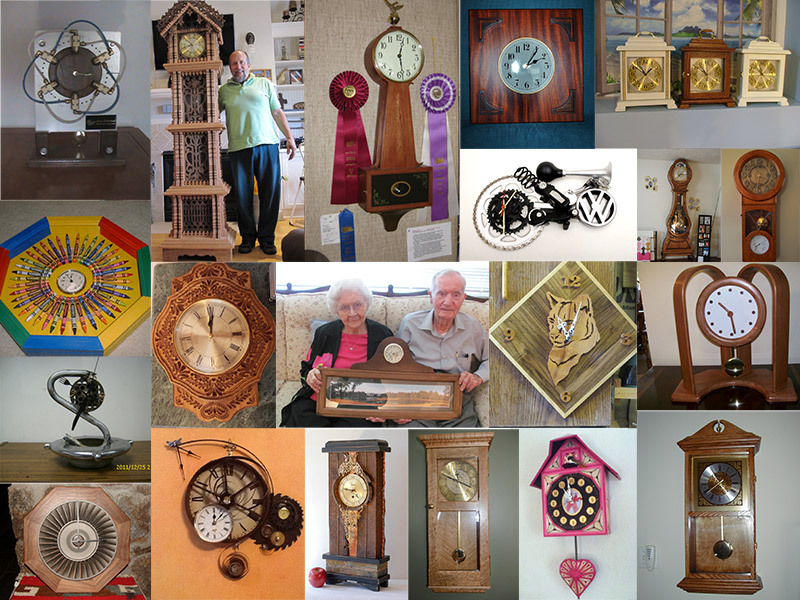 Laz Ojalde’s Grandpapa and Grandmama clocks were selected as the best of show in the Most Unusual Clock category. 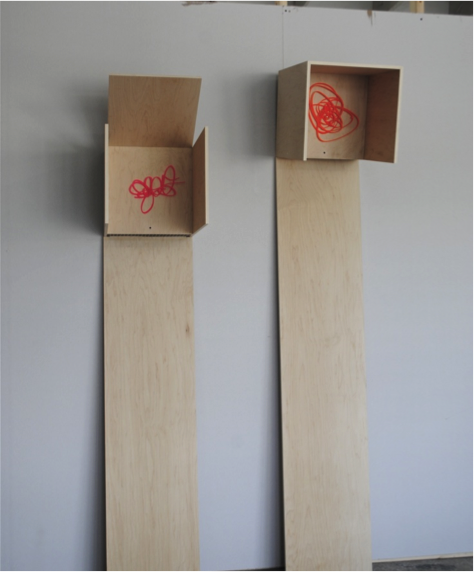 Our team was intrigued by Laz’s reinterpretation of the traditional American grandfather and grandmother hall clocks. As Laz explained, the clock forms are somewhat anthropomorphic, showing the caring presence of wise caretakers. The Grandmama clock design is characterized by her pink clock hands and outstretched arms, signaling a warm hug. The Grandpapa’s bright orange clock face looks down at all passer bys in a prideful yet tender manner. Laz’ clocks incorporate human voices reciting poetic stories of times past and nagging words of advice when the built in motion sensors detect movement from a passer by. The custom clock hands are laser cut from clear acrylic with an enamel-painted finish. The clocks use the Klockit “C” cell-powered quartz clock movements. Joe Wainwright’s Cuckoo clock was selected as the best of show in the Master Clock Builder category.This was the first clock Joe ever built, and it was not from a kit! He spent many hours designing each of the carvings and then had his CNC machine cutout each part along with the housing. After designing the clock, Joe was not completely sure the works were going to fit into the housing, but they did after a few small adjustments. 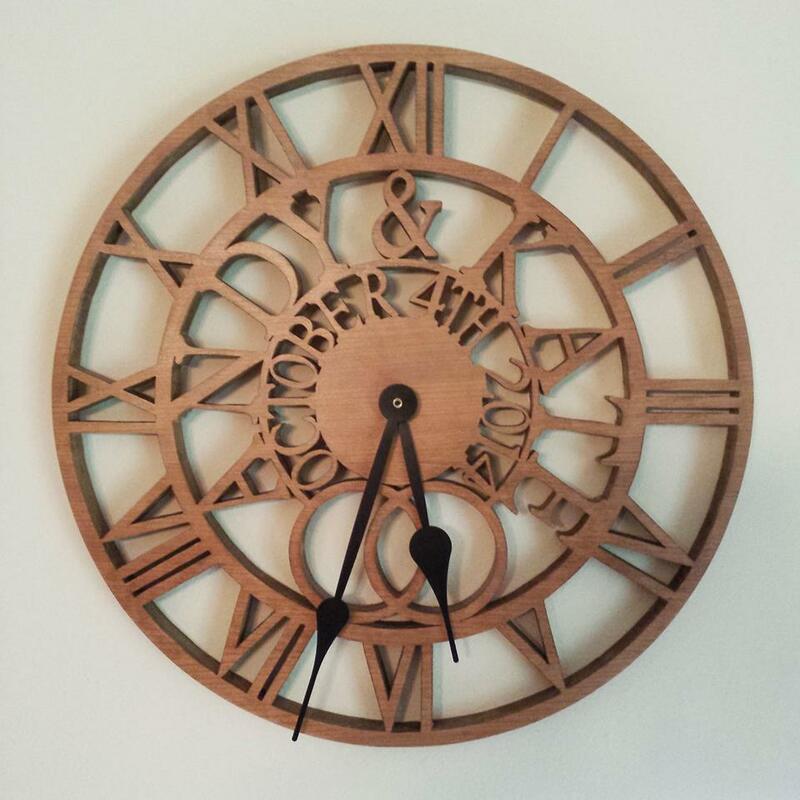 It took about 40 hours of designing and an additional 20 hours to cut, assemble, and finish this clock. 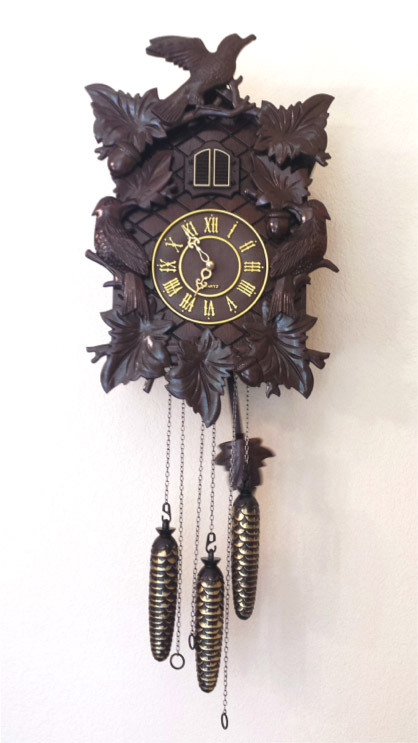 Joe’s Cuckoo clock is made of walnut wood and stained with a General Finishes Spiced walnut dark finish to represent a Black Forest clock. The clock body is roughly 17 inches tall by approximately 12 inches wide and 5 inches deep. As always, our contest judges were amazed by ALL of the entries – not just the winners. Take a look at the Honorable Mention clocks below! The Klockit Create-A-Clock Contest (the “Contest”) entry period begins on Tuesday, April 1, 2014 at 12:01 a.m. Central Standard Time (“CST”) and ends on Wednesday, April 30, 2014 at 11:59:59 p.m. CST (the “Entry Period”). Entry in the Contest does not constitute entry into any other promotion, contest or sweepstakes. The Contest will award three (3) winners one (1) $100 Klockit gift certificate for each category. Winners will be judged based on their photo and story submission in three (3) categories: Master Clock Builder, Gift of Time, and Most Unusual Clock. The Contest will be judged by the staff at Klockit. By participating in the Contest, each entrant unconditionally accepts and agrees to comply with and abide by these Official Rules and the decisions of Primex, Inc., N3211 Country Road H, Lake Geneva, WI 53147 (the “Sponsor” and “Judges”), whose decisions shall be final and legally binding in all respects. NOTE: Your entry must include which category you are submitting to (see below), at least one (1) photo, and they story behind your clock project. All entries must be received by 11:59 p.m. CST on Wednesday, April 30, 2014. Most Unusual Clock: Judged on picture and story of what makes clock unusual. $100 Klockit gift certificate for the Best-of-Show clocks in each of these categories: Master Clock Builder, Gift of Time, and Most Unusual Clock. To obtain the name of the winners, send a self-addressed stamped envelope to: Klockit, c/o Marketing Department, N3211 County Rd. H, Lake Geneva, WI 53147. All such requests must be received by May 15, 2014.